Hever Castle only 2.1 miles. 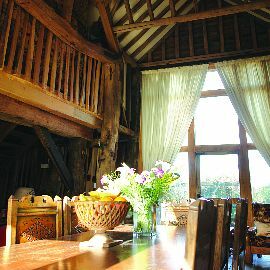 Spend time in a beautiful 300 year old Listed barn in the heart of the Kentish countryside. Dine like Henry VIII in our vaulted dining room overlooking the garden. Vegetarian and vegan diets catered. Continental or full English breakfast. 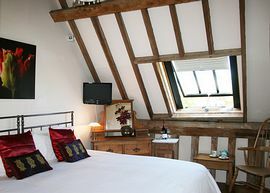 We have three lovely guest bedrooms all with en-suite facilities. 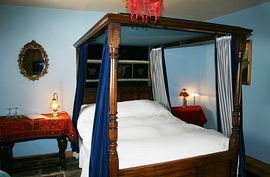 A beautiful antique four-poster, one super king, one double and 1 twin with direct access to private seating in the garden. The four poster and the garden twin are on the ground floor, with level access to the dining room and will accommodate an extra bed. All rooms can be booked for single occupancy. Becketts is excellent for business use. There is a free wireless internet connection available and if all three rooms are booked, the dining room is suitable for your breakfast meeting. Credit cards are accepted and full tax invoices issued for your expenses. For long stays in the low season, we can offer excellent rates. Please enquire by telephone or email. 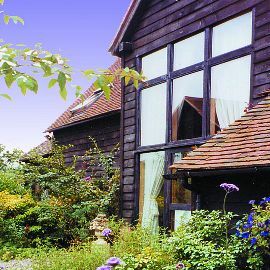 Becketts is ideally situated with Hever Castle, Penshurst Place and Chartwell all within 4 miles. There are many more National Trust propertes and gardens within easy reach. Access to London from Edenbridge is 40 minutes by train, so you can go sightseeing for the day or the theatre in the evening. There are also excellent walking routes, with a footpath passing the door. Cycles can be securely stored overnight. For dining in the evening, I can recommend you to one of the many local pubs and restaurants in this area, all providing excellent food. Check availability and book online or telephone me. All rooms single occupancy £55-£75. Discount for 3 or more days. Check in 5pm - 7pm, checkout 10.30am. Smoking Facilities: Smoking is not allowed. Smoking permitted outside in garden. Special Diets Provision: Special diets are catered for. Please give advance notice. Disabled Facilities: There are no disabled facilities. It is possible for wheelchair access to the ground floor rooms. 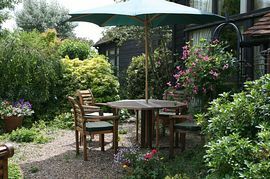 The garden room is more suitable, with a large en-suite and level access to dining room. Exit at junction 6 and follow the brown signs to Hever Castle until you reach Edenbridge (B2026). Travel through Edenbridge in the direct of Hartfield. Go approximately 3 miles and you will pass the Queen's Arms Public House on your right. Do not turn but keep to the main road for 0.5 miles and you will see a white sign (Harnett, Claydene Farm) on the right. Turn off on the bend opposite into Pylegate Farm. Plenty of parking available immediately to the left.